 Quality engineered to your specific height requirements. sag or dish (supplied as standard).  Fire proof construction.  Meets IBC requirements. Meets OSHA requirements. 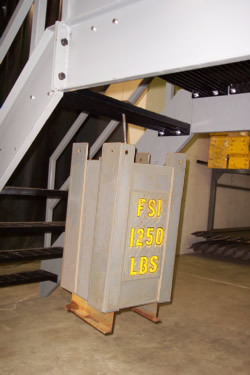  Standard 36" or 48" wide treads, 41 1/4" or 53 1/4"
plate treads are 12" deep.  Stainless Steel assembly hardware included. designed to meet your height requirements. 2. Business (see Section 304): Group B. 3. Educational (see Section 305): Group E.
than 50 shall have a width of not less than 36". 7. Mercantile (see Section 309): Group M.
R-3 as applicable in Section 101.2, and R-4. 9. Storage (see Section 311): Groups S-1 and S-2. are permitted a 78" headroom clearance. not more than 4 3/4". stair width of the adjacentwinders shall be used. shall comply with Sections 10.5.1 through 1011.5.5.3.
of carpets, rugs or runners. 306.3 Low-hazard factory industrial, Group F-2. with the walkline and a minimum tread depth of 10"
within the clear width of the stair. the riser/tread dimension in Section 1029.13.2.
risers where the tread depth is less than 11". 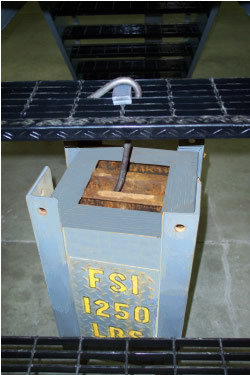 pressurized at more than 15 psi gage (103.4 kPa) . permitted to have a maximum riser height of 8"
and a minimum tread depth of 9". prepared in accordance with Section 414.1.3.
shall not exceed the smallest by more than 3/8". in the same flight of stairs. of not less than 1" but not more than 2". be classified as Group H-5. as Group I-1, I-2, I-3 or I-4. than 9/16" from the foremost projection of the tread. (nosings) of treads shall project not more than 1 1/4"
edge of the floor at the top of a flight. 1011.5.5.3 Solid risers. Risers shall be solid. constructed in accordance with Sections 1011.10.
the door shall not project more than 7" into a landing. situation to complete building evacuation. ditions specified in Section 308.4.1.1 or 308.4.1.2.
homes and foster care facilities. 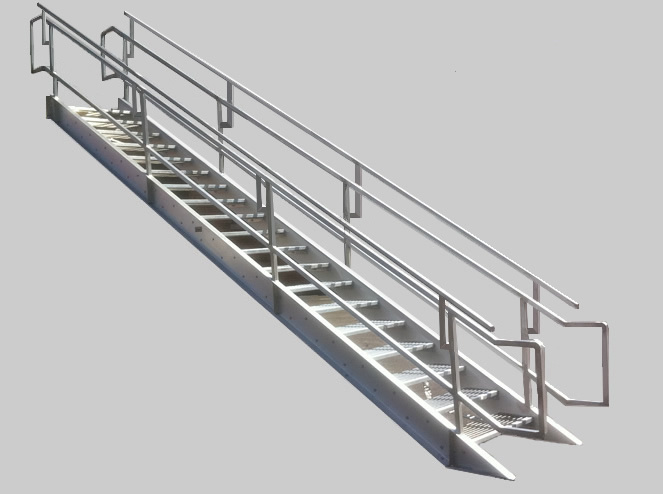 handrails shall be permitted for all types of construction. way treads and landings shall have a solid surface. Finish floor surfaces shall be securely attached. detoxification, including but not limited to hospitals. of the International Residential Code. of 1 1/8" cannot pass through the opening. 1011.7.3 Enclosures under interior stairways. directly from within the stairway enclosure. through 308.5.5 (see Section 408.1). mitted to be constructed as Group R.
1011.7.4 Enclosures under exterior stairways. 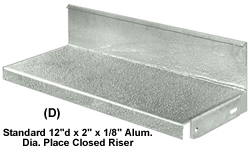 enclosed in 1-hour fire-resistance-rated construction. smoke compartment to other smoke compartments. 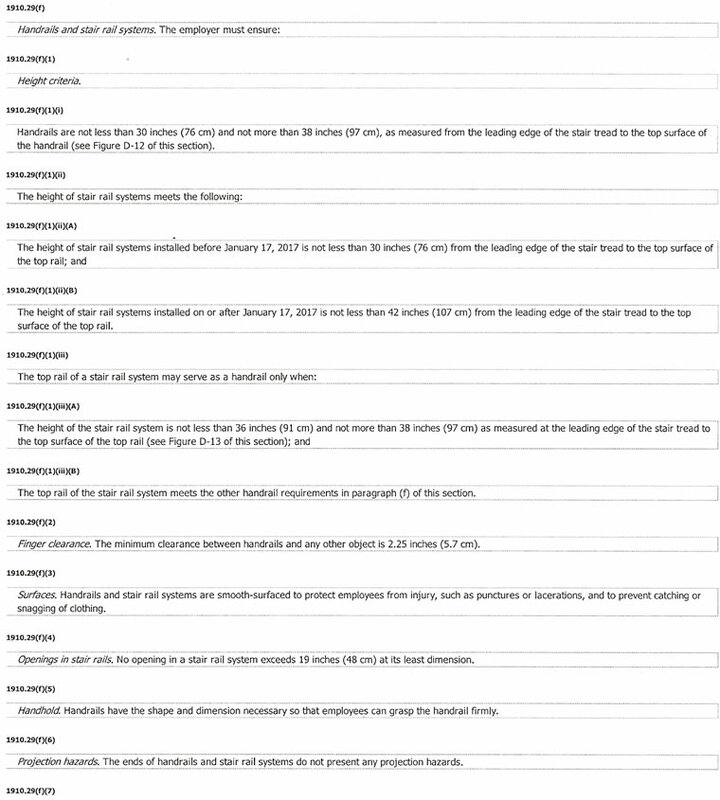 areas in accordance with Section 410.6.
risers shall be sufficient to provide a headroom of 78"
minimum, but riser height shall not be more than 9 1/2". the allowable area limits of Section 508.2.
door does not require handrails. 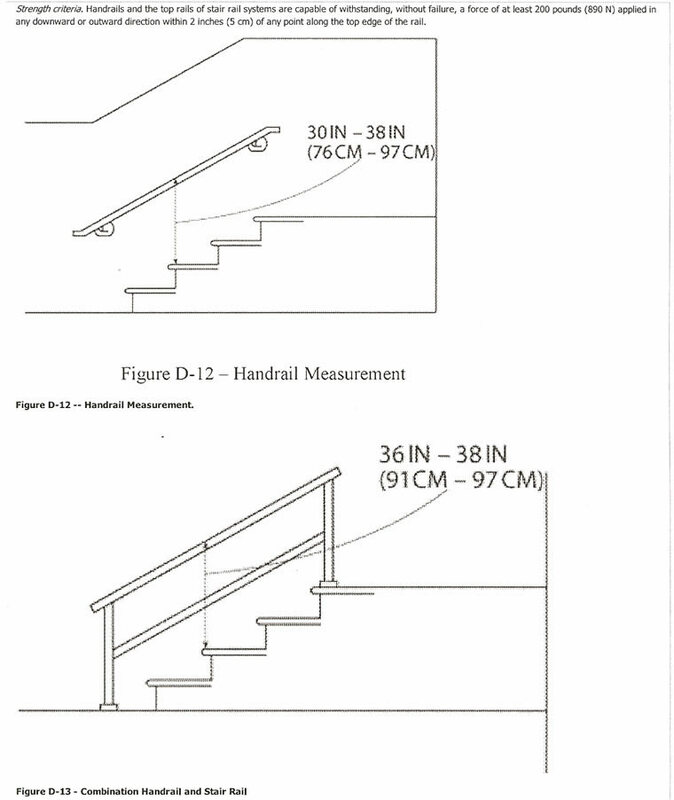 Group R-2 and R-3 do not require handrails. out single thickness divisions; or in paper wrappings. penthouse complying with Section 1510.2.
a minimum dimension of 2'. shall be constructed in accordance with Section 1015.
stalled in accordance with Section 1015.
between floor levels or landings. 1011.14.1 Handrails of alternating tread devices. 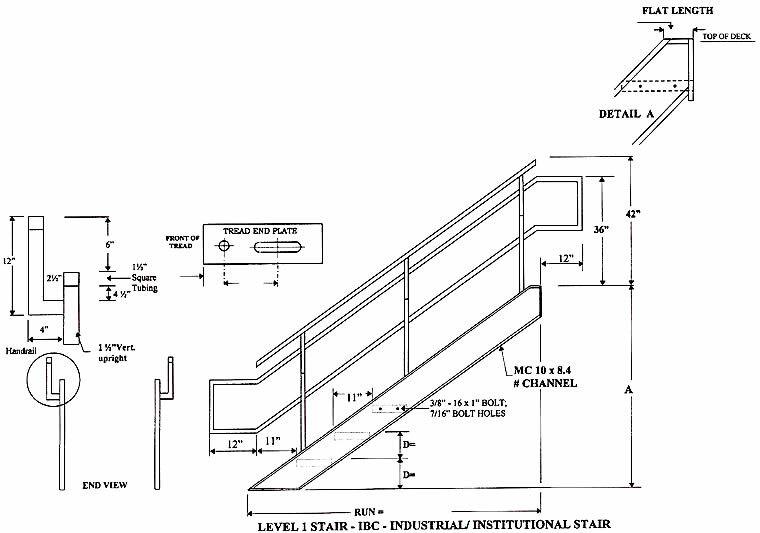 tread devices and shall comply with Section 1021.
platform, landing or floor surface. 1. On the loading side of loading docks or piers. of special lighting or equipment. tread depth of 10 1/2". along glazed sides of open-sided walking surfaces. shall be provided on both sides of ships ladders. 8 1/2". The maximum riser height shall be 91/2". 1. From the adjacent walking surfaces. necting the leading edges of the tread nosings. tenance, repair or monitoring of equipment. jacent walking surfaces or adjacent fixed seating. the leading edges of the treads. 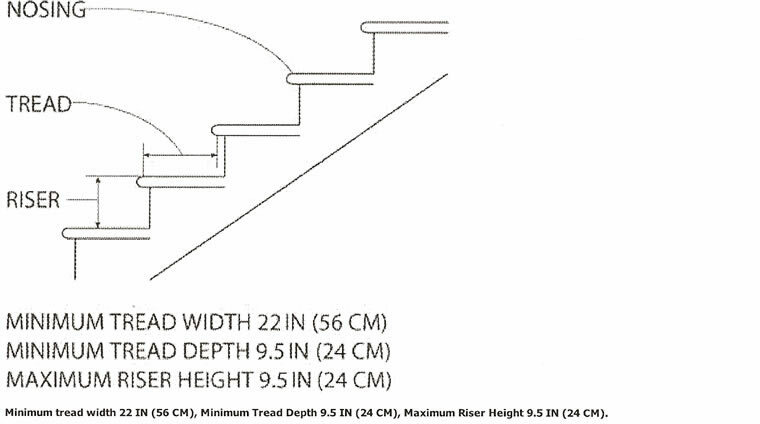 stairway access in accordance with Section 1011.12.1.
than 30" and not more than 34". dia. from the walking surface to the required guard height. openings that allow passage of a sphere 4 3/8" in dia. allow passage of a sphere 6" in dia. allow passage of a sphere 21" in dia. dia. up to a height of 26". From a height of 26" to 42"
have openings that allow passage of a sphere 8" in dia. age of a sphere 4 3/8" in dia. 30" above the floor or grade below. not less than 30" beyond each end of such components. passage of a sphere 21" in dia. equivalent graspability. a minimum radius of 0.01". open side of the walking surface. have a minimum radius of 0.01". the passage of a sphere 21" in dia. interrupted by a newel post at a stair landing. 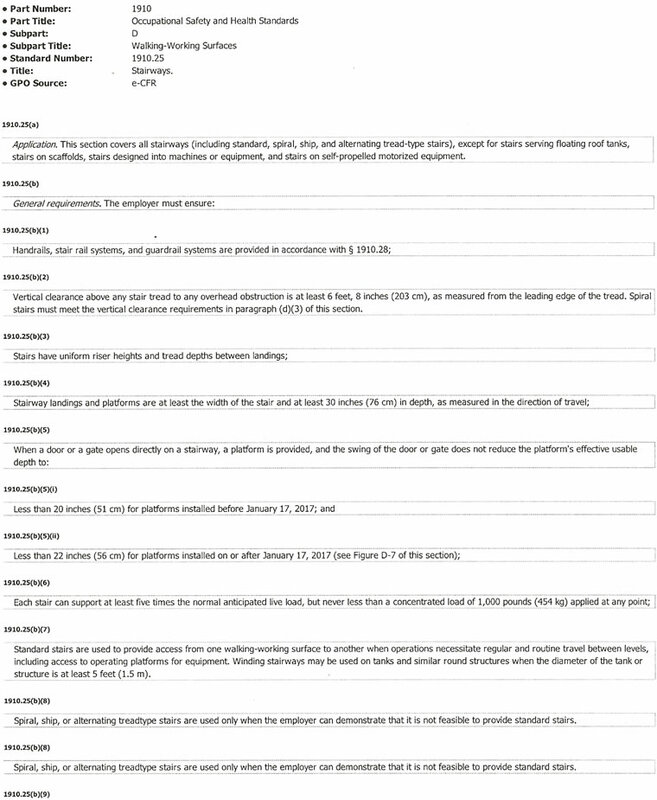 or starting easing is allowed on the lowest tread. 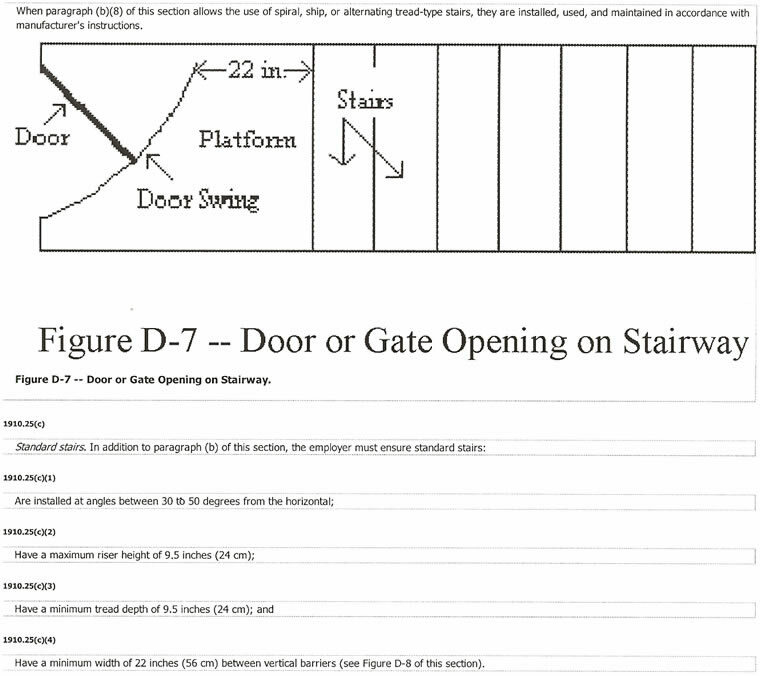 than 36" above the finished floor and more than 72"
continuous to the handrail of an adjacent stair flight. stairs at stairways and the ramp runs at ramps. area required by Section 1030.2.
the top riser to the bottom riser. and a wall or other surface shall be not less than 1 1/2". handrail shall be free of any sharp or abrasive elements. rails shall not constitute a reduction in the egress width. mediate pair of handrails that is greater than 6".